47 mm titanium case, 7.9 mm thick, titanium back, brushed titanium crown, brushed titanium bezel with polished edges. 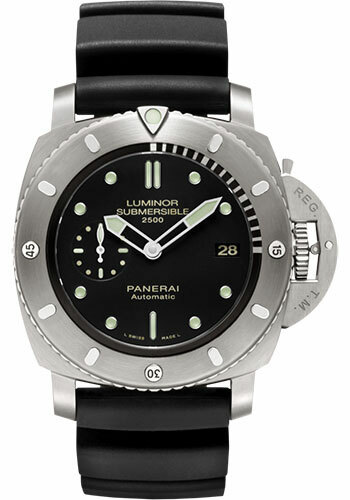 anti - clockwise rotating bezel with graduated scale for measuring the duration of immersions and ratchet click at minute intervals., sapphire crystal formed of corundum, black dial with applied luminous hour markers, date at 3 o’clock, seconds at 9 o’clock, calibre p.9000 automatic movement with hours, minutes, small seconds, date, calculation of immersion time, approximately 72 hours of power reserve, black caoutchouc strap. Water resistant to 250 bar.